Notice any thing odd about this picture? 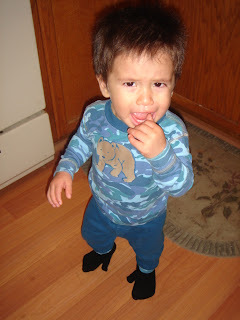 Well, when I got their socks, I grabbed some mittens for Felix, thinking they were black soxs (no not red sox Elaine). It was a long day, so I just put them on him anyway. He looked at them and pulled at the "tumb" for a while. 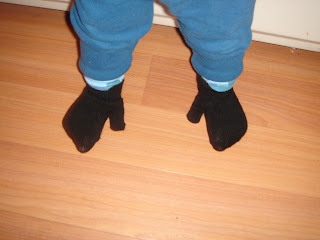 Then just wore them like any other sock all night and next morning till he got dressed. That's what Chone called them! I put Isabella's shirt on backwards the other day...didn't notice until her kindergarten teacher asked if she dressed herself today..